A pretty set of carousel baby bedding sets the stage in the baby's nursery that will allow you to decorate the room with one of my favorite themes; horses! There’s nothing quite as magical as the circus where you can stroll around and see the sights while you listen to the music of the carousel. If a visit to the circus or carnival as a kid is one of your favorite childhood memories, I have some decorating ideas that will assist you in using those experiences to decorate your baby's nursery. All it takes is some imagination to use the circus animals and carousel horses as decorations that will set the stage for a unique carnival themed baby room beyond compare. You can surround your baby with fun of the circus or a day at the park with a merry-go-round or a border of carousel horses on the walls. The key to decorating with a carousel horse theme is to be very selective with your choices in decorative accessories. It’s always best to give one special collectible or vintage piece the spotlight than to clutter the room with a dozen cheap items that don’t have no personal meaning or presence. You may be wondering if carousel baby bedding will work for a baby boy’s carousel themed room and the answer is, of course! For a boy’s nursery I would suggest working with a set of vintage toile carousel crib bedding that you might accessorize with some carousel animals in masculine colors rather than feminine white horses decorated with flowers and jewels. There are carousel crib bedding sets sewn from toile fabrics with cute pictures of monkeys, carousel animals, dancing bears and a lion tamer or master of ceremonies commanding the performance in a carnival or circus tent. The brown and rosy red or dark pink toile print on an antique tea stain brown background will coordinate beautifully with a stripe or plaid fabric. This combination of patterns would be very attractive in a baby boy's nursery where pastel carousel baby bedding might be too girly. Baby bedding sets with carousel horses are normally not considered to be unisex or gender neutral, but with some tweaking you can make the theme masculine enough to please the most macho of dads. 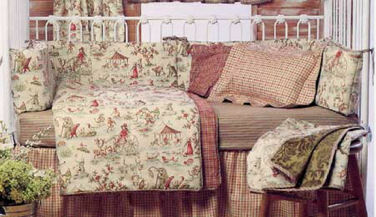 If you have a baby girl, you can still use a set of vintage toile carousel baby bedding. The secret would be to play down the chocolate brown colors of the fabric and focus on highlighting the shades of pink and red. If the antique look is not your taste, get a set of carousel crib bedding with cute, white carousel horses dressed up with huge pink satin ribbons and bows. 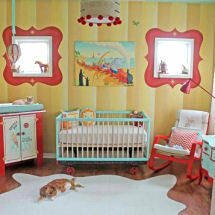 White carousel horses are fun to decorate for a baby girl’s carousel room. Carousel baby bedding featuring white horses accented with hot pink, turquoise blue or lime green maps out the perfect setup for a feminine carousel horse baby nursery theme. FOR more Carousel Nursery Themes & decorating advice, please visit Unique Baby Gear Ideas' homepage to find many diy decorating projects and decorations that can be useful in a special carousel themed room for your newborn.